예천 한천사 철조비로자나불좌상(醴泉 寒天寺 鐵造毘盧遮那佛坐像)은 광배(光背)와 대좌(臺座)가 없어진 높이 1.53m의 철조불상이다. 우아하면서도 침착한 인상을 풍기는 얼굴, 건장한 신체, 의젓한 앉음새, 탄력 있는 다리 등은 통일신라 후기 불상으로서는 보기 드문 뛰어난 기량을 나타내고 있다. 왼쪽 어깨를 감싸고 있는 옷은 어깨에서 내려오는 옷주름이 비교적 힘있어 보이고 자연스럽게 처리되었으나, 팔과 두 무릎의 주름에서는 형식화된 모습을 보이고 있다. 긴 상체, 평평한 콧잔등, 유난히 두드러진 인중 등에서 추상화된 경향이 대두되는 작품으로 당시 유행하던 철불상들 가운데 우수한 작품이라고 할 수 있다. This Seated iron Vairocana Buddha is 1.53m tall. Although its mandorla and pedestal have disappeared, its excellent appearance shows skills rarely seen among Buddha statues from the end of Silla. The robe, whose pleats come down from the left shoulder, looks strong and it is naturally treated, but the pleats over the arms and knees have a more formalized appearance. The long upper body, the flat narrow part of the nose, and the exceptionally prominent philtrum are characteristic of late Silla when a trend of abstraction began to appear. 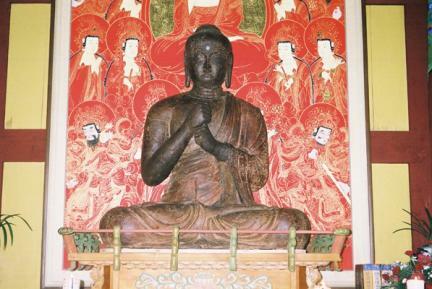 This is an excellent example of the iron statues of Buddha that were prevalent at that time.